The Mt. Carmel High School baseball team hosted Del Norte High for their sixth annual baseball game benefiting the UC San Diego Moores Cancer Center. Both teams wore jerseys with names of people who were either fighting cancer or who passed away from it. The Mt. Carmel Sun Devils wore purple tops in honor of booster club President Scott Schaller-whose son was the starting pitcher-and who was recently diagnosed with pancreatic cancer. The Nighthawks wore special light blue jerseys for prostate cancer. When he arrived at the game, Schaller had no he was being honored by his sons’ team. 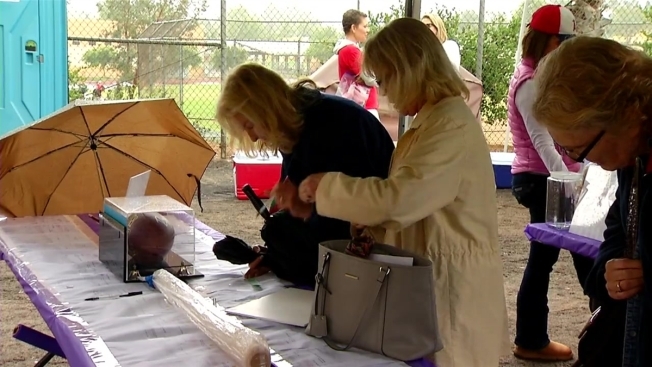 A silent auction went on during the game for people to bid on the special game worn jerseys and other items such as gift baskets and a Steve Garvey San Diego Padres jersey. All proceeds go to the UCSD Moores Cancer Center. Maria Andrulonis got involve two-years ago when, just before her 32nd birthday, she was diagnosed with breast cancer. Andrulonis, a Mt. Carmel graduate, got a call from a friend asking if he could wear her name on his jersey. Now that she’s got a clean bill of health, she’s helping with the fundraiser to give back not just to her alma mater, but the treatment center that helped her get through her ordeal. If you would like to help or learn more about the UC San Diego Moores Cancer Center, you can find them on Facebook or go to their website at http://cancer.ucsd.edu/.